A beautifully textured crochet triangle scarf that uses 1 basic stitch. 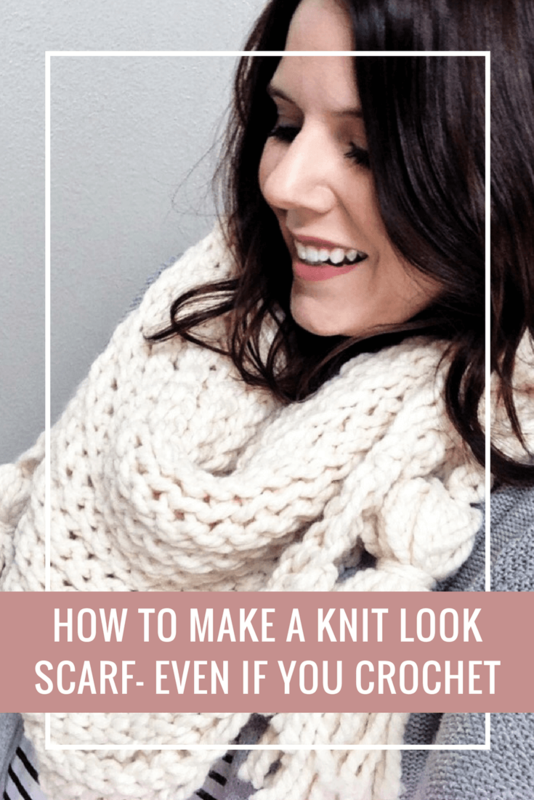 With this free crochet pattern you can make a knit look scarf even if you crochet. You'll love the modern tassels too. Scroll down for the crochet video tutorial. 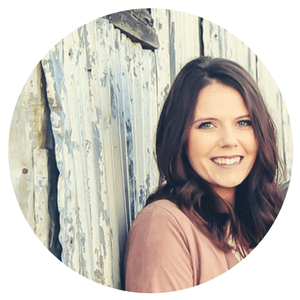 I’ve been crushing on crochet triangle scarves with these huge tassels for quite a while now. Add in my obsession for knit look stitches, a new GIANT hook , and a 3-hour road trip. 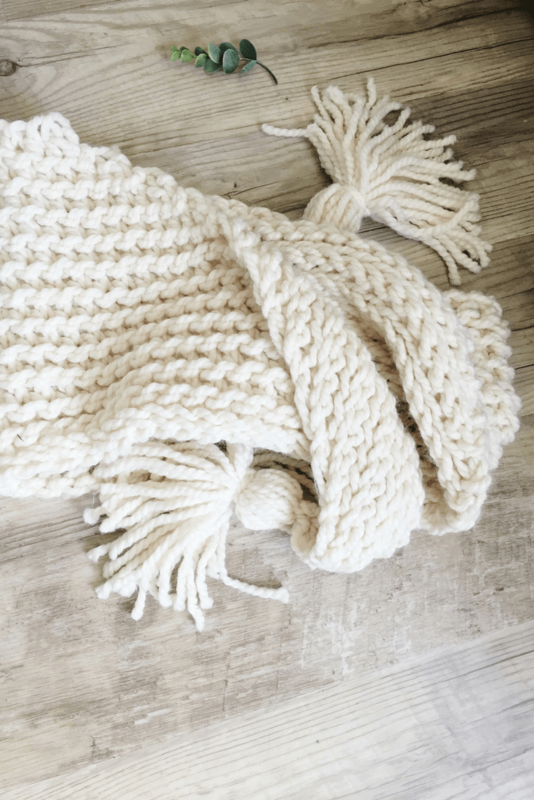 You get a cozy, chunky scarf, that can hide your coffee stain from this morning. 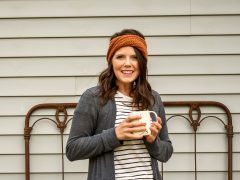 Add this crochet triangle scarf to a basic “mom outfit” and you’ll instantly feel put together. The generous size of this scarf can also be worn as a shawl. The slip stitch in the back loop technique is the perfect texture for the crochet triangle scarf. It creates ridges that have a unique look you just want to touch. 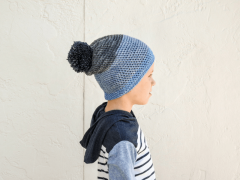 Here’s a ribbed beanie crochet pattern using the same knit look stitch. Keep your tension loose. Slip Stitches are a very tight stitch. Working the stitch loosely will make it easier to insert your hook. Use a bigger hook. To keep your stitches loose and the edges straight, look at the recommended hook size for your yarn and double it. Count your stitches. This may seem obvious, but it’s really easy to miss the last stitch at the end of the rows. So check your stitch count every once in a while. The front loop is always the loop closest to you. The back loop is the furthest from you. Regardless if you are working the right side or wrong side of the scarf. This video tutorial will show you how to slip stitch in the back and front loops. 2 Skeins Super Bulky Weight Yarn (180-200yards): Lion Brand Wool-Ease Thick and Quick Yarn in color Fisherman (weight 6oz/106yd per skein) The Everly Hat Crochet Pattern uses the same yarn. (FLO) slst2tog: insert hook into FL of stitch, insert hook into FL of 2nd stitch (you will have 3 loops on the hook), YO, pull through all the loops on the hook. (BLO) slst2tog: insert hook into BL of stitch, insert hook into BL of 2nd stitch (you will have 3 loops on the hook), YO, pull through all the loops on the hook. At the beginning of each row, the pattern reads (BLO) or (FLO). Work the entire row in the indicated loop. Starting at row 4 & in each row thereafter: You will slst2tog in the first 2 sts of the row & again in the last 2 sts of the row. If you need help with the abbreviations I have a crochet cheat sheet. You will have 3 sts remaining at the end of the scarf. Break yarn & weave in ends. Attach your tassels to the top two corners of the triangle scarf. Watch this quick video tutorial to learn how to DIY Yarn Tassels. Your new cozy scarf will go great with any outfit. I really want to wear mine while I curl up with a book & cup of coffee. Maybe I should make a blanket using this stitch too! Simply brilliant. I totally love this esthetic. 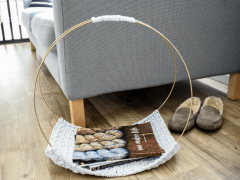 I am going to give this a try with my new Amour Clover Q hook by increasing the stitches. I would love to make a throw. You have inspired me. Many thanks! It’s so fun using a jumbo hook! And the quick project is a nice bonus. A throw would be beautiful! Let me know how it goes. I am french…. and I love this scarf, do you have a french translation of this pattern ? I’m really confused on how to do row two without turning. Is there a video? I don’t have a video of this step. Instead of turning to begin row 2 you will be working along the other side of the chain. For example, on row 1 if you inserted your hook under both of the loops, on row 2 you will insert your hook into the back bumps of the chain. I hope this helps! I will add this to my video list. That’s what I did – turn but work into the foundation chain. Thank you Sierra so much for this pattern. I just love it!!! Any video on the tassels yet?? The video is so close to be done! I’ll leave a comment here when it’s published. Thanks Sierra!!!! Scarf is almost done and I cant wait to finish it with that special touch!! Waiting……. Hi Toby! You can view the quick video to make the tassels here. THANK YOU SO MUCH FOR YOUR PATTERN TIME AND VIDEO!!!! I JUST LOVE IT!! Yay! I have a few of those yarns in my stash too. Just waiting for the perfect project. The triangle scarves are great. A fun twist on the traditional look. 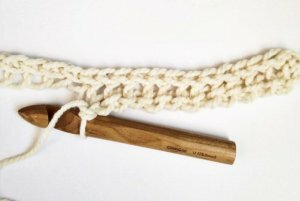 How do you switch yarn when the first skein finishes? I’m having issues figuring that out. I just add the new skein on in the middle of a slip stitch. For example: Insert your hook, instead of yarning over, add the new yarn onto your hook, and pull through the loops. Sometimes I tie the 2 loose ends in a knot. I know this isn’t the “proper” way to add a new skein, but it works. I’ve never had a piece come undone. When you are on rows 1 and 2, do you slip stitch the whole chain or just the FL or BL on each row? Thanks, love this scarf so far. There are 2 ways you can do these rows. 1. Work row 1 in the front loop of the chain and row 2 in the back loop, like you mentioned. 2. Work row 1 in both loops of the chain and row 2 in the back bumps of the chain. I’ve found that method 1 is the easiest! I hope this helps. Thanks so much, my daughter is going to love this scarf! I also love your basket base tutorial. You are most welcome Joelle. Thanks for stopping by! J’aime Beaucoup ce modèle, mais ai un peu de difficultés à traduire les explications…..
I’ve don’t have a translation of my patterns. I will keep it in mind. Thanks for the suggestion. Hi there! I love the look of this scarf, for a child’s size (9yrs old) how many would you chain? Also how do you make the tassels?? I haven’t made this pattern is a child size, but it will be so cute! I would try starting with a chain of 50. If that doesn’t work and you need to adjust the starting number, make sure a beginning chain is an even number. I need to do a quick video of the tassels. When I get that ready I’ll let you know. The finished size is 7″ long. If I’m using bulky yarn (5-6) would you still start with 50? I started with 70 and it’s looking short? Or how do you put it on so the scarf stays on? With a lighter yarn weight, you could follow the pattern as written and get a smaller size. The scarf doesn’t wrap completely around. Here’s how I wear the scarf: The triangle point is in the front, then take the 2 points, with the tassels, and cross them behind your neck. Then pull the tassels forward over the top of your shoulders. The adult size measures 48″ wide at the beginning.